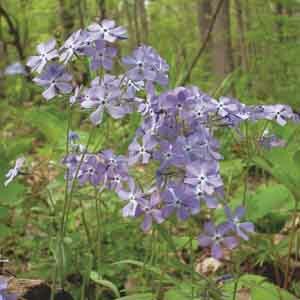 Woodland Phlox take "the middle ground" between taller upright Phlox species and the low, creeping ones. A multitude of dainty blooms, atop short stems, provide a cheery spring showing, then spreading mounds of foliage fill in beautifully between later blooming perennials. Perfectly sized for rock gardens and border fronts. Tumbles beautifully over rocks, slopes, and banks. Looks great spilling over container edges. Easy to grow! Best in fertile, humus-rich, well-drained soil. Keep soil moist, watering freely in dry weather. Trim back lightly after flowering.